I always Detune my old Dimauro when I’m not playing it. No one ever told me to do that, just seems with a guitar that old, to be a good idea . Is it necessary at all? I've never heard of having to do that Van but I don't have very old guitars. Humidity (or lack thereof) and heat (or very cold) are killers but unless there is some structural problem I would think that cycling the string tension like that would just cause fatigue on the strings themselves. I was strongly advised by several luthiers to detune older archtops to mitigate sinking of the top. From this I would speculate that this is much less of an issue for a selmac with bent or forced top (as opposed to carved top), and that the repeated cycles of adding / removing load would offset the benefits. It would be great to hear from the forum's builders to get a properly informed opinion. I have always been curious about this, and never managed to get a clear answer somehow. Van, how does the top look from the side? Not sinking down by the neck/soundhole? That bow probably occurred sometime(s) if it got overheated with the strings under tension. Keep it nicely at room temp or thereabouts. Also good to store it in case but not near an exterior wall especially one that faces the sun in summer. A lot of heat can come thru the wall depending on insulation. Best place is in a closet that doesn't have an exterior wall. Yes any adhesive will soften if heated. Room temp and 50%RH and u r good to go. If it's a valuable and/or instrument that you are attached to keep it in a hard case and invest in a case humidifier and hygrometer. Nice old Di Mauro Boogie Woogie. They are quite light weight and have a lively sound. I had one similar a few years ago and from many I have seen they usually had a plain wood bridge with no moustaches (although many have had them added) and no other decoration. 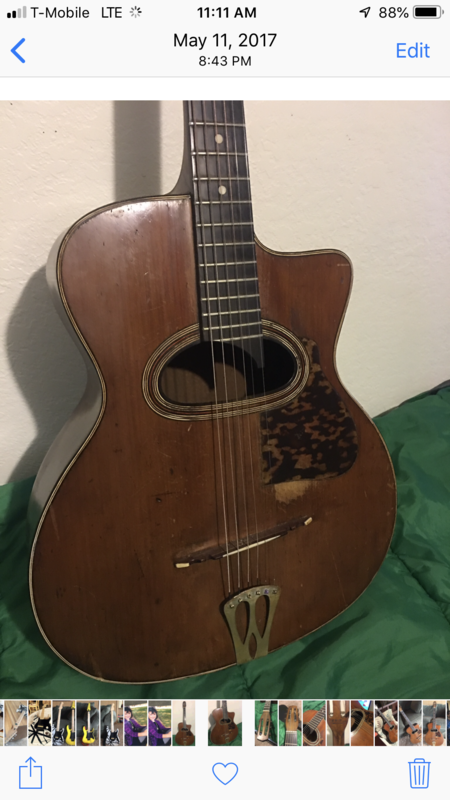 It was more common for Italian made guitars to have those little inlays on the bridge, I have a Bucolo with the same, and I wonder if that one is possibly not the original but was a replacement sometime back in history. If you search Google images, or even back through the Di Mauros Michael has sold on here you will see what they usually look like. Having said all that, I have read much where it was common for Di Mauro, Jacobacci and probably others in the circle of Paris based Italian luthiers to use each other's parts to get guitars out the door to fill an order, and it was known that Di Mauro was friends with Carmelo Catania who continued making guitars in the Italian style. No matter anyway, still a great guitar. Nice.